On 9th December 1946, the Constituent Assembly of India met for the first time in the Constitution Hall now popularly referred to as Central Hall of Parliament House to begin drafting the Constitution. 207 members were present who signed the register and submitted their credentials. As of December 1947, the Assembly had 299 members: 229 members elected from 12 Indian Provinces and 70 members nominated from 29 Princely States. Of these 299 members, 15 women representatives were a part of the Assembly. 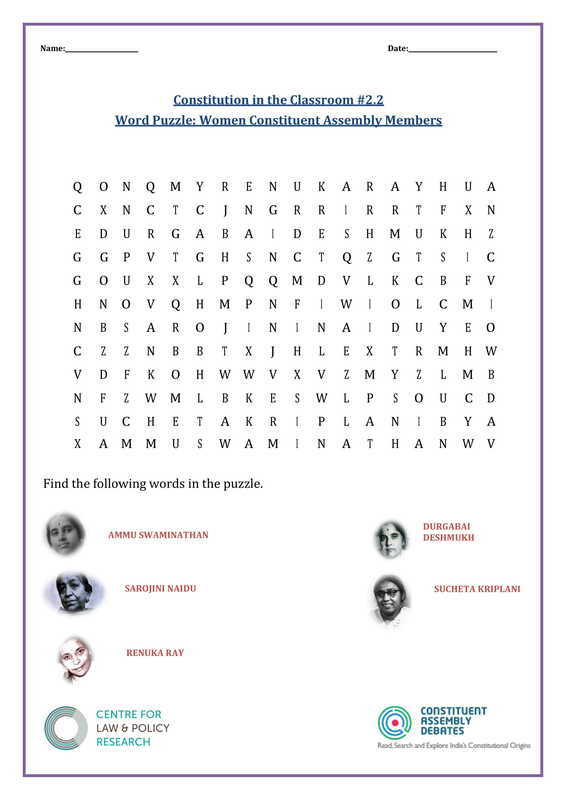 This word puzzle hides names of 5 women Constituent Assembly Members. Can you find them? This exercise is designed for students of grade 4 to 6.